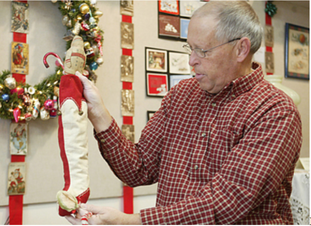 Kit Karsten holds a Christmas stocking containing toys from the 1800s. Photo by Brian Forde. Area residents can celebrate the holiday season with a journey into Christmases past with the "Christmas Through the Ages" exhibit on display at the Dekker Huis/Zeeland Historical Museum. The exhibit, open through the end of this month, features Christmas ornaments, stockings, cards, and other items that span more than 100 years. The exhibit comes from the vintage collection of Grand Rapids resident and internationally renowned expert David Eppelheimer. "The ornaments are very expensive and very unusual," said Kit Karsten, of the Zeeland Historical Society. 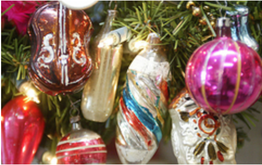 Karsten said the ornaments date from the 1880s to 1980s. Also on display are antique stockings, garland, and 300 to 400 Christmas cards. He also highlighted an illuminated aluminum tree from the 1950s, which was "very popular at the time." Eppelheimer's collection includes decorations from West Michigan, such as items from window displays from downtown Grand Rapids stores, as well as items from around the nation and Europe. Christmas ornaments from the 1920s to the 1950s are on display at the "Christmas Through the Ages" exhibit at the Dekker Huis/Zeeland Historical Museum. Photo by Brian Forde. Eppelheimer, a kindergarten teacher in Coopersville, has been collecting antique ornaments and decorations throughout his life. His collections have been highlighted in "Better Homes and Gardens," "Country Living," and other publications, and he as appeared on the television show "Martha Stewart Living." Eppelheimer owns the business The Elves Antiques in Grand Rapids. "Christmas Through the Ages" will be showcased at the museum, 37 E. Main Ave. in Zeeland, through the end of the month. The museum's winter hours are 10 a.m. to 2 p.m. Saturdays. Admission is free with donations accepted. For more information, call 772-4079.